Opening and installing Google PlayStore android applications programmatically from your own application is very easy. So in this tutorial, I am going to show how to open and install google play store apps from your application. If you have developed multiple android application then you can increase downloads/users by adding an install button in your other application and increase revenue from android app. You have to add little bit java code in your activity file onClick event. In this example I have added a button in XML layout file and added onClick attribute to open Google PlayStore app install directory while clicking the button. Make sure you have added following permission in your application AndroidManifest.xml file to make working with following code. Now, run your Open and Install Google PlayStore Apps Programmatically android application and click the Open and Install App button then click Install button to install. In this example I have used twitter package name. 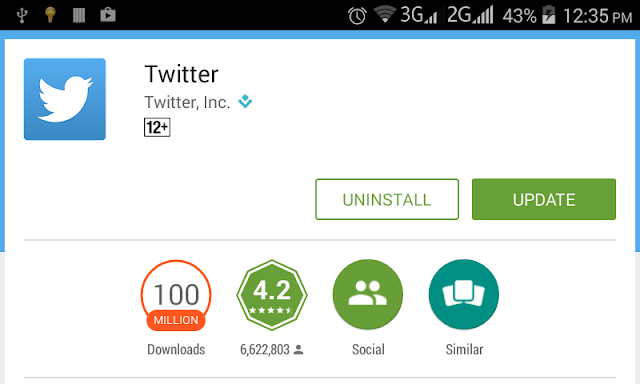 So, you will see twitter app in play store. 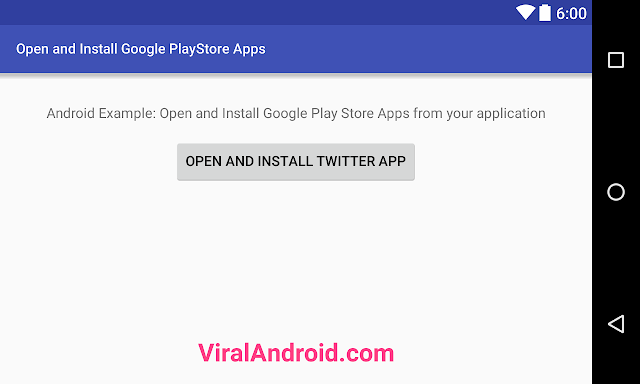 Change twitter package name with, your another application package name which is submitted in PlayStore.